Deli heritage and a fresh tradition since 1976. Since 1976, DRUXY’S Famous Deli has championed its traditional Deli roots while continuing to offer customers fresh, nutritious food backed by warm and caring service. We take great pride in both the quality of our food and the classic way we prepare it to-order for each and every customer. Today we are Canada’s premier chain of quick service, traditional Jewish style deli restaurants, with 44 restaurants and kiosks in major health care facilities, office towers, shopping centers, museums and airports. Owners Bruce, Harold and Peter Druxerman are still directly involved in the daily management of the company, and play an active role supporting our passionate team of franchisees. Most recently, DRUXY’s has acquired Williams Fresh Café, an all-day, every day café for those people who appreciate delicious food, signature coffee blends, and specialty espresso and tea beverages. To learn more about this fresh family member, visit the Williams Fresh Café website. 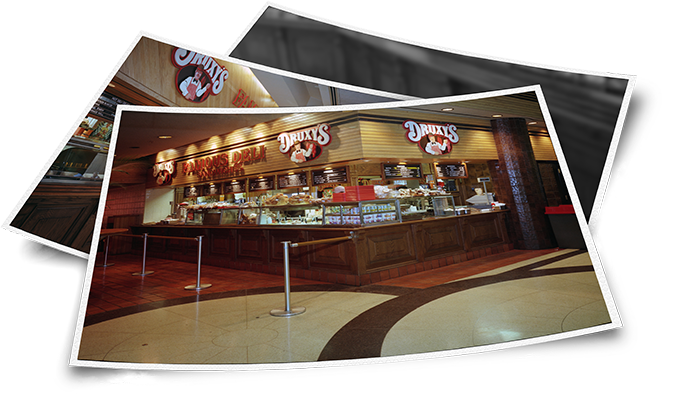 Our first DRUXY’S Deli opens in the Royal Bank Plaza in Toronto’s financial district. As the decade comes to a close, we begin our expansion in the downtown Toronto area. Our DRUXY’s Deli revolution picks up momentum as we open additional locations in office towers and shopping malls throughout the Toronto area. After 15 years of running up to 50 corporate delis, we begin expanding our traditional deli format into a franchisee model with new locations opening in hospitals, museums, airports and suburban office complexes. Our memorable “Be Good Today” radio campaign kicks off in 2004 and runs for 5 years with almost a hundred different messages based on DRUXY’s deli-inspired philosophies. In 2007, DRUXY’S also becomes the first quick service chain to participate in the Heart and Stroke Foundation’s Health Check program. We introduce our Fresh Deli Revolution design showcasing our fresh food displays, along with a new concept called The Construction Site, which specializes in gourmet grilled cheese sandwiches. 2016 was a big year for us as we celebrate our 40th anniversary! We also acquired the Williams Fresh Café brand, adding an additional 26 Ontario-based locations to the DRUXY’S family. DRUXY’s continues to champion its deli tradition offering customers fresh, nutritious food backed by warm and caring service. Fresh and nutritious food has been DRUXY’S focus since we opened our first deli. Today we serve a wide selection of Healthier and Special Diet Options plus a range of sandwich sizes, which make DRUXY’S a reliable destination for healthy eating. And yes, you can always share your sandwich! Our team franchise-wide actively supports numerous charities each year with food donations, gift cards and auction items. No matter what the event or cause, we always want to be involved. Since 1995 we have also had a special relationship with Camp Awakening, a camp for physically challenged children. Our campaigns promote and raise funds for the camp. Camp Awakening is relevant to our customers and our involvement makes a difference. In addition to promoting healthy eating, we also actively support our customers’ healthy lifestyles. Through Alpine Ontario and the many ski clubs across Southern Ontario, we support adult ski racing and House Leagues. We also maintain rewarding partnerships with Freestyle Ontario, Ski Telemark and Track 3, a non-profit charitable organization that teaches children and youth with disabilities to downhill ski and snowboard. All these programs foster fun competition among youth and adult ski athletes across Southern Ontario. We are also proud to have been the first Quick Service food chain to participate in the Heart and Stroke Foundation’s Health Check Program in Ontario. Although the program is no longer being run, these Healthier Options are still highlighted on our menus in order to help our customers reduce fat and salt consumption while increasing their protein and fibre intake. For customers with allergy concerns we do our very best to prepare foods with as little cross-contamination as possible, preparing sandwiches on sulphite paper, using clean utensils and gloves. DRUXY’s, however, is not 100% allergy-free. With bread in our restaurants creating gluten dust, and nuts and seeds in our salads and pastries, there is always a chance for cross-contamination. We always warn our customers of the risk, however, and proactively ask them to guide us through the preparation process to better meet their individual needs and expectations. Want to Become Part of the DRUXY’s Family? We are always looking for new team members to work in our delis, and are happy to meet individuals who are interested in making a more long-term commitment to DRUXY’s as a franchise owner.